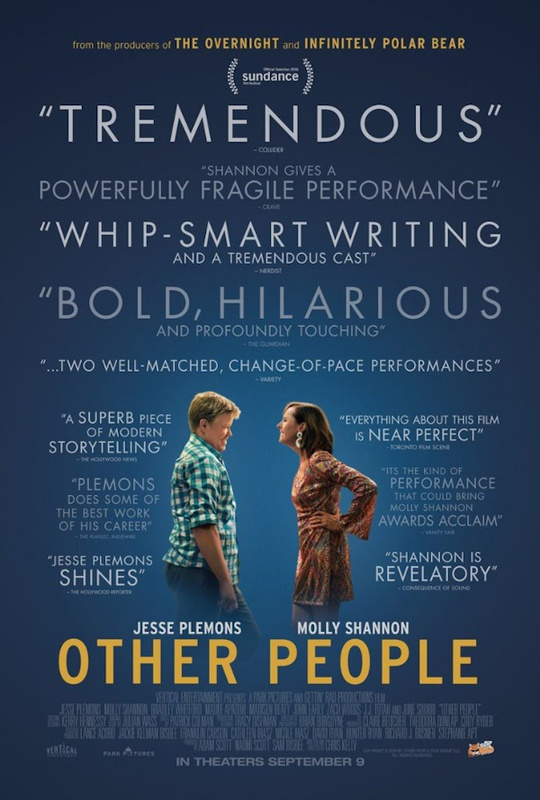 “Other People” is a pretty good, albeit somewhat trivial, family drama with a superb cast and a couple of very strong, emotional moments, especially towards the end. It may not have been all that I hoped for – it starts to meander along a little bit during the middle, and by now, I’m really sick and tired of the stylistic device of opening a movie/tv-episode with a later event, only to then double back and tell how they got there – but it’s worth watching nonetheless. My major disappointment with the movie was that even though at its center is just a regular family tragedy that could happen to everyone, over the course of the movie they went and made quite a big deal of David’s gayness after all. Granted, I’m not the biggest expert when it comes to queer films, but from those that I’ve seen, almost all of them put considerable emphasis on the fact that the main protagonist – be it male or female – is LBGTQ. It’s like, once you’re LBGTQ, your life is dominated by said LBGTQ-ness, marginalizing all other concerns. Here, for a while it seemed like they would go down a different road, showing David as gay without making a lot of fuzz about it – thus seemingly telling its audience “Guess what, queer people lead regular lives too.” (Oh, really?). Which I would have found quite refreshing. Unfortunately, before too long, we learn that David and his dad had a big falling out after he came out to them. He seems to try to do his best to pretend that it never happened, never asking him about his relationship and his boyfriend, never inviting Dennis along, and even declining to visit their shared apartment. Which unfortunately also means that “Other People” ultimately falls trap to the common trope of a family resolving their issues because of a huge tragedy that befalls them, which serves as catalyst for reconciliation. Personally, I really would have preferred it the movie wouldn’t have made such a big deal about David being gay, instead simply telling a common story that everyone can relate too, but whose protagonist just simply happens to be gay, whaddayaknow. Maybe one day, we’re actually going to get a movie with a LBGTQ protagonist where her/his sexual identity and preference aren’t big issues who dominate the film – thus emphasizing that they are just regular people that lead normal lives, dealing with the same issues that all of us are dealing with. “Other People”, regrettably, may not quite be that film yet – but at least it’s a step in the right direction. This entry was posted in identities, movie reviews, new releases and tagged 2017, Chris Kelly, drama, identities, identities 2017, Jesse Plemons, Molly Shannon, Netflix, Other People, queer cinema, USA. Bookmark the permalink.